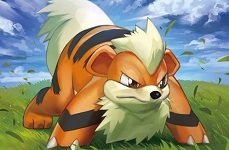 Bio: For the longest time, Volzer was Gugenhagen's only Pokemon companion. The man considers the serious, down-to-earth Electivire his equal in every regard, and the bond they share is unbreakable. They often spar together, despite their inherent differences in power, and Volzer remains Gugenhagen's only true confidant - the only soul in the world who knows everything about the broken man. 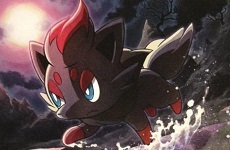 Bio: The only other survivor from the Yveltal incident that razed the Old Lion's village, Gugenhagen begrudgingly decided to retrieve the then-young Larvesta worshiped at the village's Temple and save its life. In times of prosperity, Solhelm natives worshiped the Sun and believed Helzer to be the Solar God personified. When disaster befell the settlement, all faith abandoned Gugenhagen, and he regards Helzer with some manner of resentment, despite the silent sun moth having none of the blame. 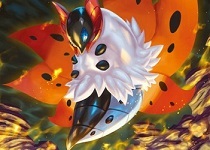 Helzer's power is on a level above all others in Gugenhagen's team, but in its quiet, contemplative nature, the Volcarona rarely employs his powers for destruction. 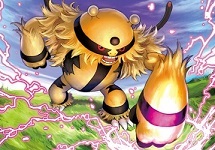 Bio: Brinzer was Gugenhagen's wife's only Pokemon, and now remains the elder's only memento of his dearly departed Amelia. 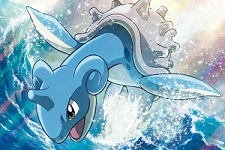 The Lapras is a caring, delicate soul who dislikes fighting despite her incredible battle potential - it is only when her companions are in danger that she will willingly step into action. For a man as power-hungry and fueled by revenge as Gugenhagen's become, Brinzer might seems as though she doesn't fit, but in reality, she is often the voice of reason and the only one who can remind Gugenhagen of his deeply-buried good nature. 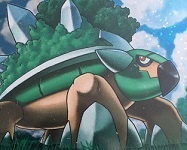 Bio: Gotzer is a Torterra as old as the land itself, and as a result of centuries of existence, has grown gigantic even by its species' standards. It used to be considered a guardian spirit of Gugenhagen's village, but after it was destroyed by Yveltal, it has since joined the elder in his quest for revenge. Despite his immense wisdom, Gotzer blames himself deeply for the disaster that befell the village he was supposed to protect, much like Gugenhagen, despite there having been nothing he could do. Despite his desire for revenge not burning nearly as intensely as his Trainer's, he has nevertheless vowed to protect the last remaining villager of Solhelm to the very end - the only thing left he can do. Bio: Zenzer's origins are a complete mystery, even to Gugenhagen. 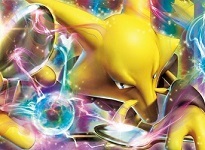 The manipulative, mocking mind-reader shares a common goal with the elder - the destruction of Legendary Pokemon - for reasons he will not disclose, but his mental powers are frightening and, admittedly, a welcome addition to Gugenhagen's ranks. He craves power above all else, but does not regard Gugenhagen as a friend - simply the means to an end. The feeling, however, is mutual. Last edited by Maskerade; 04-13-2019 at 05:05 AM. 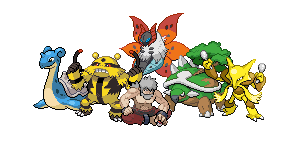 Bio: Yamato is a Trainer from the small, peaceful town of Azalea, and the younger brother of Johto's last Champion, Yuzou. Having lived in the prodigy's shadow all his life, but content to proudly admire Yuzou and all of his achievements, Yamato was left in utter disbelief when his brother suddenly resigned his position, released his Pokémon and disappeared without a trace overnight. 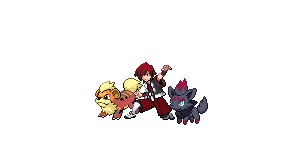 Ever since that day, Yamato has vowed to find his brother and seek answers for Yuzou's actions - enraged that he would besmirch the Sawa family name when he was at the top of the Pokemon World, the youngster now aims to surpass his brother and restore honour to his lineage. A traditionalist who believes in the merit of hard work above all else, moved by a burning sense of justice and an eagerness to grow ever stronger, Yamato will never turn a blind eye to a challenge or a person in need. Last edited by Maskerade; 04-08-2019 at 04:37 PM. Last edited by Maskerade; 04-08-2019 at 04:39 PM.